A&A Coatings offers a vast array of coating solutions for the chemical industry. From tools made from rubbers, plastics, fibers, resins to agricultural chemical processing equipment, our specialized coatings are highly instrumental in extending the service lifespan of the industrial equipment used. 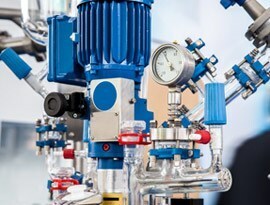 When it comes to manufacturing original chemical processing equipment to reconditioning industrial components, staying compliant with quality benchmarks and specifications is our top priority. Most of our thermal spraying processes are performed at atmospheric pressure, whereas plasma spraying is performed in torpid atmospheric conditions. Coatings in the chemical industry are primarily used for protecting chemical storage vessels or pressure vessels. For example, chemical reactors that are exposed to strong acids and organic solvents need to be sprayed with tantalum coatings (APS-sprayed). In addition, we use both sacrificial and non-sacrificial coatings to protect chemical processing equipment. A&A Coatings has built its thermal spraying capabilities for chemical industries through 7 decades of our business existence. We can offer your business a competitive advantage through lower maintenance or replacement costs when your chemical equipments enjoy a longer service lifespan. In case you need coatings for specialized applications, we are always ready to supply materials for testing and welcome a discussion based on your needs. Give us a call today!